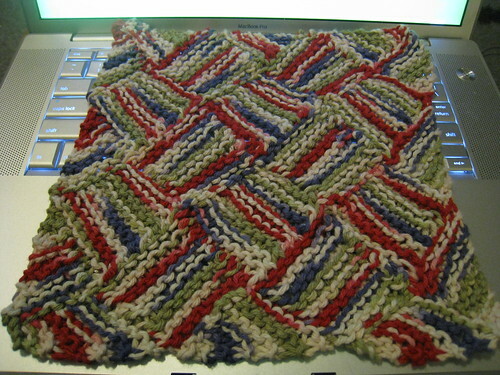 I finished up this scruffy looking dishrag last night while watching the 2nd season finale of Lost. I wonder if mastering the garterlac technique would have been easier if we had been watching a show that is even slightly less confusing. Hrmm… Thankfully I had that flickr tutorial, and these instructions for an alternate method for starting it out. The Dishrag of Dooooom! is done and I will probably cast another one on later today. Yay! Wait, what? You mean I have other projects I could be working on? But… but… it’s garterlac! Adorable, charming, utterly delightful garterlac! And we still have 4 seasons of Lost to get through before anything about it makes any sense!! Previous Post Dishrag of DOOOOM! Hah, you think Lost will make sense.